"Heady Topper is an American Double India Pale Ale. This beer is not intended to be the biggest or most bitter. It is meant to give you wave after wave of hoppy goodness on your palate. Tremendous amounts of American hops will creep up on you and leave you with a dense hoppy finish in your mouth. So drinkable its scary." 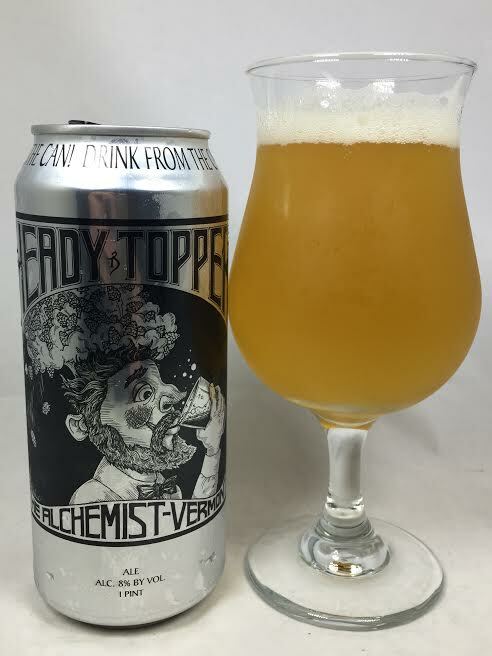 The last of my trio of Alchemist reviews this week is here and did you really expect me to end with anything less than Heady Topper? Even if you're not into craft beer, or not into craft beer that much, you know what Heady Topper is. This notorious DIPA brewed by The Alchemist was once the highest-rated beer in the world on Beer Advocate and it draws people from all over the country to Vermont just so they can pick up a few cans at the brewery and has them scouring the state for liquor stores that carry it. The Alchemist themselves have gone through so many changes. Originally a brewpub in Waterbury center, the pub was destroyed by Hurricane Irene in 2011. They rose from the ashes and moved shop just a mile or two away to open the cannery that became a Mecca for beer enthusiasts. After years of success and numerous production expansions, the brewery was still running out of inventory on a weekly basis. Sadly, the growing crowds and traffic disrupted the local neighbors who filed a complaint with the city. The Alchemist shut down the cannery/retail store to the public, but thankfully the new brewery is open today. Heady Topper has had a tremendous influence on the craft beer world in New England as every new brewery aims to make world-class, hazy IPAs. Has Heady been able to continue to make its mark in a world today with so many new breweries? Is it being left in the dust and only being considered great for its time? Well, no need to worry, folks, because I am here to the rescue! I've taken several trips to Vermont and visited the old cannery multiple times, so this is not my first dance with Heady Topper. After having easy access to so many Trillium IPAs and having had the chance to try Tree House on a semi-regular basis, I am excited to see if Heady still stands up. Pours a hazy golden orange with two fingers of white head. I find it funny that THIS used to be considered a dirty-looking beer, but oh my how the beer scene has changed. A wet, dank, hop juice aroma is overpowering in a good way. Lots of pine needles and a hint of grapefruit juice. Given the aroma, I was anticipating more of an intensity with the hops. I'm not saying they aren't there, my point is that the taste is incredibly balanced while still holding big hop flavor. I basically expected a non-stop hop overload, but I am very pleased with what is going on here. Initially a wave of grapefruit and even peaches strike first. On the transition, the pure hop juice flavor is back without extreme bitterness, but it immediately switches to something sweeter and even dessert-like. An overall aura of pine and spruce is present in all aspects. Something I want to mention is that the very end of this tastes so dank and weed-like and is a perfect cherry on top. That's when you have it out of a glass. If you drink from the can like they say you should, the entire beer is wrapped in that dank quality in addition to everything other flavor mentioned before. The can basically takes the best part from drinking out of the glass and makes it the whole show. Here's an analogy... It's like playing the original Mortal Kombat: Having the fight itself was fun, but what you really wanted to do was FINISH HIM! and see the Fatality. Drinking from the can is basically just watching Sub-Zero rip people's spines out for the entire game. Mouthfeel is pretty much perfect. It's medium in body and feels smaller than an 8% DIPA with great carbonation. Drinkability is through the roof, so watch that abv as you destroy your 4-pack. So, how do I rank the world-famous Heady Topper? What was once THE must-have beer in New England is still the same beer I remember from so many experiences. The beer scene in New England (Massachusetts specifically) has produced breweries that churn out massive juice nukes every single day. I love the juice-forward intensity of Trillium and Tree House and they are every bit as good as everyone says they are. Does Heady still stand out even after the emergence of all of the New England powerhouses? I still say yes. Years ago, people craved for the hop intensity of West Coast IPAs to be brought to the East Coast. Heady Topper did that, but made it much more drinker friendly. Heady didn't sacrifice hops in order to raise drinkability, and they also integrated some tropical hop flavors and aromas and left the beer unfiltered to capture all of the sediments and oils. It blazed a trail for what we love in the area today as evident by so many breweries doing the so-called "New England IPA". I'm not hyping it up or grading favorable just because it is Heady, the beer really is a nearly perfectly balanced hop and juice experience. I say it's definitely worth the hype and reputation and still hangs up there with the other best of the best. Looks like I'll have to plan another Vermont trip soon.